It’s not unusual to see a celebrity roaming the corridors of Sydney Children’s Hospital, Randwick. Film, television and sports personalities make time to call into the wards, bringing smiles to the faces of patients, families and staff. Every visit is special, but sometimes they can create moments so meaningful for patients, they can forget that they’re in Hospital. 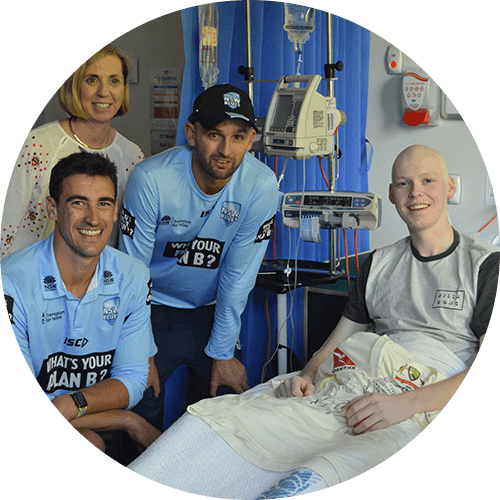 "My wife Leisa and I would like to thank Cricket NSW and the Sydney Children’s Hospital Foundation for providing an opportunity for Nick to smile and forget for a while how he was feeling. 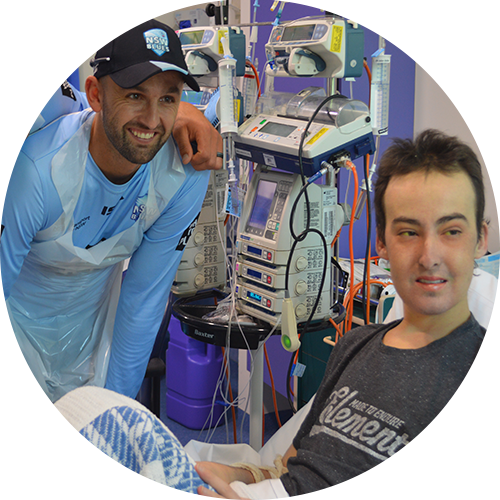 In particular a big thank you to Mitchell Starc and Nathan Lyon for coming to see Nick. An hour or so of their time is such a wonderful gift and I don’t think they will ever know just how much of a gift they provide in coming to the hospital. Nick was a bit nervous about meeting his heroes – what do I ask them, what will I say." "It sounds like he managed this OK and was so excited. However if they had seen him earlier in the day, they would have seen Nick, who is currently going through his chemo treatment not feeling too well in the morning. 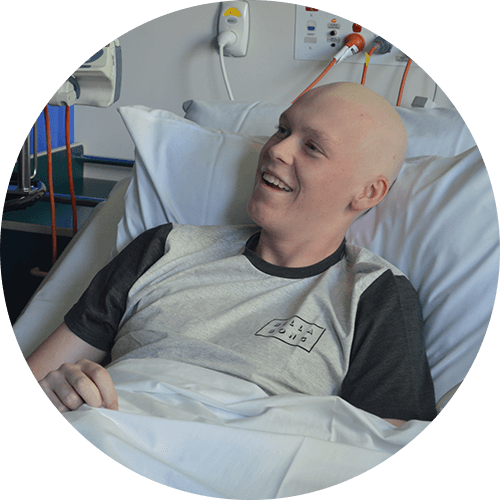 Typically when Nick goes through his chemo he ‘hibernates’ – sleeps, can’t eat and just waits for his body to come good – this can be days. However Leisa said when Mitchell and Nathan turned up he was beaming from ear to ear and for an hour or so, forgot about how lousy he had been feeling and smiled, chatted to his heroes and became Nick the cricket fan, not Nick the patient. As parents we feel somewhat helpless that we can’t step in and help fix our children, so we would give anything to see them happy and smiling. Mitchell and Nathan’s gifts of their time, signed bat, cricket ball and cricket shirt were truly mementos that Nick will cherish forever." "It would be very much appreciated if you could pass this message on to Mitchell and Nathan, as they probably don’t quite understand the joy and happiness they bring and the difference they make in just being there. To them they probably saw a 15 year old in hospital, smiling and happy (and bald). To us we saw our son forget what he was going through for a while. Nick was so excited when I spoke to him later in the afternoon that he sounded like our normal cheeky 15 year old – he was telling me all about the shirt, the bat and the record making pink ball and all the questions he had asked. Genuine happiness is easy to see – just look at the photos. When I went in to see him earlier this evening he had curled back up into a ball and had gone back into hibernation to sleep off the chemo. We will be forever grateful for the time Mitchell and Nathan gave up from their busy schedules to provide a huge amount of happiness for Nick. Thank you so much. "I would like to convey my gratitude to Mitchell Starc, Nathan Lyon and coach for visiting my grandson Daniel at the children’s hospital today. Words cannot express how I feel at the joy they gave my grandson, son and husband, and their generosity of time. 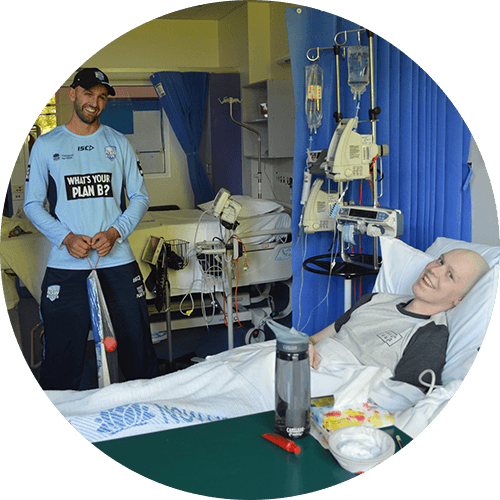 I know it will always be with Dan, such a keen cricketer, to meet these talented cricketers in his hospital room. We hope he will get stronger from the joy he felt today. Very sadly, Dan passed away since the visit, but his family were incredibly grateful that he got to meet his heroes. Thank you to Cricket NSW and Cricket Australia for bringing Nick and Dan so much happiness.